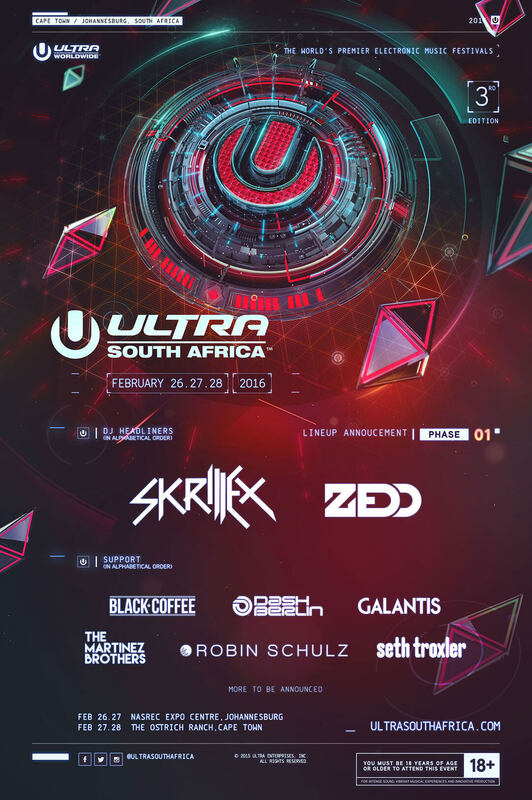 Having announced groundbreaking expansion plans in both Johannesburg and Cape Town for 2016, ULTRA South Africa is pulling out all of the stops to guarantee that next year’s edition will be the biggest yet, as it reveals the first phase of star-studded talent set to grace Africa’s largest electronic music gathering next February. Gearing up to take center stage across both cities early next year and making his long-awaited ULTRA South Africa debut will be global megastar, bona fide hit maker and OWSLA label boss, Skrillex. A true ULTRA favorite, having already played editions in Miami, Japan, Korea, Bali, Singapore and the Philippines throughout 2015, Skrillex will no doubt have some surprises in store for the crowd as he brings his internationally celebrated performance to ULTRA South Africa. In another huge first for ULTRA South Africa, the prodigal mastermind behind chart topping hits such as ‘Clarity’, ‘I Want You To Know’, ‘Beautiful Now’ and #1 album ‘True Colors’, Zedd, will be joining Skrillex on Main Stage duties. With countless platinum discs to his name and a world-renowned high-energy style fusing everything from Pop and Electro to Trap and Bass, Zedd is set to stun Ultranauts and first time revelers alike with two high-octane performances in Cape Town and Johannesburg. Fellow German DJ and producer extraordinaire Robin Schulz will also be taking to the decks for a master class in dynamic track selection, while veteran Dutch trance icon Dash Berlin and exploding Swedish outfit Galantis round off the Phase One Main Stage billing in style. With an even broader scope of acts primed for this year, ULTRA South Africa will also be welcoming the much-hyped RESISTANCE Stage for the very first time, complete with some of the finest names in the house and techno world. Legend Seth Troxler will be leading the charge, making his first 2016 ULTRA festival appearance. Joining him to entertain the crowds at Resistance will be inimitable American duo The Martinez Brothers and local hero Black Coffee, who recently won Best Breakthrough artist at this year’s electronic music DJ Awards in Ibiza. In what will be a first for ULTRA South Africa, the Cape Town edition will also be offering its fans the chance to camp at the picturesque West Coast Ostrich Ranch across the two days. Those who were lucky enough to purchase Early Bird tickets for Cape Town back in June (for what was originally going to be a single day event) will now be given access to both the Saturday and Sunday of the festival. Early Bird tickets for both events sold out within minutes of going on sale, so fans will have to be quick to guarantee their spot this February. For those that want to experience the action firsthand, Advance, Regular, VIP and VVIP admission tickets are now on sale for the Johannesburg and Cape Town editions, with all the necessary information below. With double the dates of last year’s event and a blockbusting Phase One Lineup, ULTRA South Africa is yet again set to smash its way into the record books. *One ticket purchase grants access for the 2-day festival of choice (Cape Town or Johannesburg). Follow ULTRA SA on Facebook and Twitter for real-time updates on artists, tickets and camping, and for those that haven’t yet, relive the breath-taking thrills of ULTRA South Africa by watching the stunning 2015 aftermovie.